Open tomatoes and drain them well so remove all the liquid from the can. Mash them around well to make sure they are mostly dry. Dice tomatoes and combine with diced jalapeno and diced red onion. Squeeze lime juice over salsa and season with salt. Set aside for later. In a medium pot over medium heat, add the butter and flour and cook until the butter is melted and forms a roux with the flour (thick paste). Continue to cook over heat for a few minutes until the roux turns a light tan color. Slowly start to add milk to the roux. Whisk continuously as you add the milk so no lumps form. Add the milk in 1/3 cup batches until it's all incorporated. You will need at least two cups of milk to reach the desired consistency. At this point you have a basic bechemel sauce. Continue to simmer this until it thickens. Then stir in all the grated cheese. Once cheese is melted, season with salt and pepper. If the queso dip is too thick, add a bit more milk to thin it. In a large bowl, pour all the queso dip and add the salsa directly into the center. 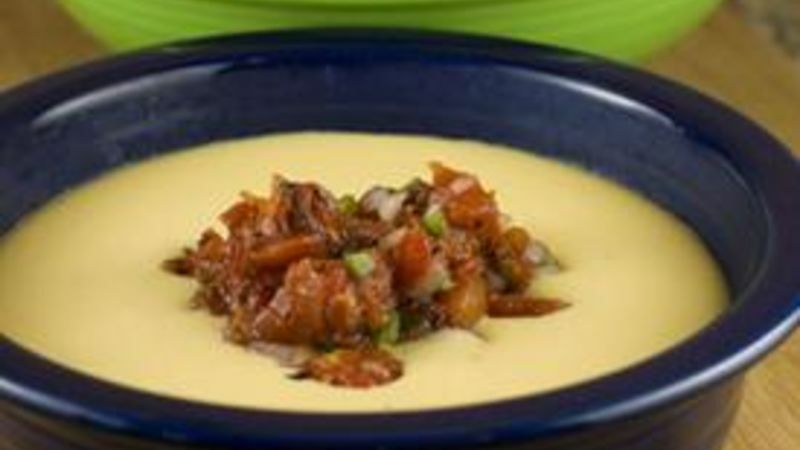 Once the dip is served you can just stir the queso and salsa together to make a great dip. While the dip will cool, it won't congeal much so you can keep serving it cold or reheat in the microwave. It’s very possible that I’m happily married today because of my ability to make delicious homemade queso dip. My wife is a huge Tex-Mex fan. I’m pretty sure she could eat some sort of spicy, cheese-covered dish every day of the week if she had her way. Queso dip is easily her favorite. A lot of people don’t know it’s possible to make a delicious homemade queso dip using real ingredients. With just some butter, flour, milk, and a whole lot of cheese, you can really make something special. For this fire roasted queso dip, I made a quick salsa using fire roasted Muir Glen tomatoes. Then the salsa gets folded in with the queso and kicks up the flavor a notch! Before we get into the queso, let’s talk salsa. This salsa is super-easy to make and actually delicious on its own. The fire roasted tomatoes add a delicious smoky flavor to the salsa. The key thing to remember is to drain your tomatoes before making the salsa or it will be really runny. Just add the tomatoes to a colander and shake them around to drain off as much liquid as possible. Roughly chop the tomatoes and add in the diced jalapeno (or two if you want it really spicy), the diced onion, some lime juice, and a big pinch of salt. The longer this sits, the better it gets! To start the queso, there are some fancy-pants terms that you can use to describe the process like roux and béchamel, but it isn’t hard to make. It really requires just three ingredients: butter, flour, and milk. In a medium pot, add the butter and flour over medium heat and cook it. Once the butter melts, start whisking the ingredients together until they form a rough paste (roux). Let this paste cook for a few minutes until it turns a light tan color. You’re looking for something like this. Next, start to slowly add the milk to the roux. It helps if your milk is warm. Start with a small amount of milk and whisk it furiously as you add it. If you add too much milk at once, you’ll run the risk of having a lumpy sauce. Just work slowly and whisk continuously as you add the milk. After about ½ cup to 1 cup of milk, you’ll have a really thick gravy. This is what it should look like at this stage. Continue to add in the milk until you reach the desired consistency, which is basically a gravy. You’ll probably need about two cups to reach this consistency, but have some extra milk on hand in case your queso gets too thick later on. The hard part is over. Now it’s time for the fun part: cheese. I like to use two kinds of cheese for my queso: Monterey jack because it melts really well and cheddar for flavor. Eight ounces of each will give you plenty of cheese flavor. Add this all into the pot and whisk like crazy until the cheese is melted. This will thicken the dip substantially. If you think the dip is too thick, feel free to add an extra drizzle of milk to thin it out some. Once the cheese is melted, I recommend tasting the dip. I like to season mine with a pinch of salt and pepper, but depending on what kind of cheese you use, you might not need any extra seasoning. Serve the queso dip as soon as possible and pour in the salsa straight into the center. I didn’t use all of the salsa for mine. I used about 2/3 of the salsa for the dip. As you can see, this stuff is super-creamy and delicious. Assuming you make the sauce correctly, it will actually stay pretty creamy even at room temperature. Of course, it’s best when it’s nice and warm. Four people will have no problem devouring this. People will be very impressed with this dip. Homemade queso just isn’t something that you see very often. The salsa is my favorite part though. It gives the queso a big boost in the flavor department! Nick lives in a Tex-Mex world. And he’s okay with that. Remember to check out his blog, Macheesmo, where you can find lots of other Tex-Mex ideas. Also, follow him on his Tablespoon profile!